Catching up with an long standing friend of the site, On Stage Lighting delves into what Lighting Designer Paul Smith of Edge of Blue is working on. 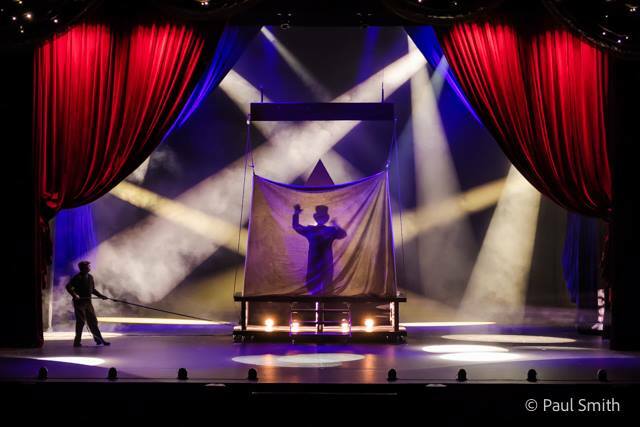 We discuss opening multiple shows at once, lighting magic tricks and the important of lighting for the safety of circus performers. Paul Smith is a busy man. Returning after a 10 year stint in the Middle East, he re-established himself back in the UK as an LD/Programmer touring with Lord of the Dance which then led him into a long touring role as Lighting Director for Ed Sheeran at what seemed to be been the most frenetic point in Sheeran’s career. As an international LD who works around the globe, and with his wife and young son living in the Philipines, you can can imagine that Paul is no stranger to airports. I caught up with him during a some prep time while he was researching and planning his latest projects, currently in the worlds of magic and circus. It is quite common for Lighting Designers to be working on multiple shows at once and when we spoke, Paul was facing a new situation to him: Opening two shows, on two continents, at the same time. There is something about the higher end of the LD market that sees many of our big names regularly engaged in what one might imagine to be a Basil Fawlty-esque dash between theatres in London’s West End, popping in for a focus here and a plot there, while associates keep the wheels turning during the LDs absence. Being an in-demand Designer and difficulties in turning work down does lend itself to this situation which many LDs find themselves in. Smiffy’s situation is even more stretching. Two shows are not playing at opposite ends of Drury Lane, but in New York City in one case and touring Australia in the other. Paul himself admits that he hasn’t been called upon to pull of such feats of teleportation before, but in this case both shows also share the same Director and Producer. Perhaps this is a good thing, at least the production team members are all in the same situation. I asked Paul how opening two shows on opposite side of the world was going to work for him. Now renamed The Illusionists, Turn Of The Century, the show is as you might expect, a series of illusions from the early 20th Century. Paul and I discussed the thrills and difficulties of lighting magic acts. “Lighting magic is often the difference between the trick working well or being given away.” says Paul, echoing my own experience with lighting illusions. I asked Paul if there were any ‘black on black’ elements in the show, called Black Art in magic circles. These are usually the most lighting-critical setups and Paul confirmed that for one of the setups, the tolerance of profile spot shutter cuts comes down to a matter of centimetres. “The illusion is lit only with six Source Four spots, with shuttering being crucial to its success” Paul tell us. “We had an issue with the rented Source Fours arriving with the lenses too dirty to allow for a precise shutter focus. We had to get the set carpenter to make donuts out of wood to improve the optics, added top-hats and gave it all a really good clean otherwise the trick was given away for me sitting 60 rows back”. Paul has ordered Source Four EDLTs (Enhanced Definition Lens Tubes) for the New York production and hopes these will clean up the edges, reduce flare and improve the final result. When it really matters, it is amazing quite how much flare comes from a lens tube, particularly a dirty rental one. This is a good reminder that cleaning your kit makes a difference. Along with troublesome flare, Smiffy recalls the extraordinary length of time it can take to focus six critical profiles on such a trick. “We’d do a rough focus without the performer, then have to tweak it with her in place. In order to get the focus precise, she would sometimes have to remain in a difficult and uncomfortable position for some time while we tried to get it right.” The focus is locked off and regularly checked, with the illusion apparatus set up along with the relevant spots lit in order to ensure correct placement prior to the trick. If you ever get the chance to light a Black Art illusion, enjoy the challenge and remember that the key thing is to hide the fact that you are using any special lighting for this particular act. In my experience, changes between ‘normal’ lighting states (perhaps needed for the intro) and special lighting needs to be imperceptible to all but another LD. Another logistical challenge for Paul was the availability of sidelight positions. “I love sidelight but wing space for booms is limited when the crew need to get the illusion apparatus on and off. These things are just a compromise”. Lighting can also help or hinder the performer during an act, for example highlighting certain elements that need to be ‘spotted’ during a balance or landing moves. Having said that, I’m always amazed at the level in which performers can generally tolerate floor cans right up in their faces while on a tightrope or performing catches in mid air – I struggle just driving in low sun. Paul’s own metaphorical juggling act balances the wishes of the Director and the acts themselves, along with his own creative input. For control, Paul has now settled on the Grand MA range of consoles as his particular weapon of choice, currently the Grand MA 2. “I’ve used most of the pro desks over the years, I can’t face the thought of learning any more and the MA does everything I need now or might need in the future. I’m still learning too.” It’s often the case that when discussing a move over to the MA, many LD/Programmers of a certain age will list the Hog III at a startlingly coincidental point, just before them taking up their now favoured desk of choice from Germany. Smiffy and I continue to discuss desks and generally shoot the breeze until we both realise that he’d better get back to his prep for these shows and I’ve got my own work to do. Chatting to other lighting peeps is always fun and rewarding. Thanks go to Paul for taking to the time to stop by. Hopefully, his two shows on opposing continents will go well under his and his Associates’ guidance. Have you got any tales of magic or circus lighting to share with On Stage Lighting readers? These are really interesting subjects that aren’t often discussed, so join us in the comments section below. Which Stage Lights Should I Use For My Show?